How humans eat has always been evolving. Most of this change is due to man’s own evolution. When people had to work harder to get food, they ate less. Technology and convenience now offer food choices 24/7. This shift from only eating once a day to the carefully prescribed three meals a day took thousands of years to change. But just in the past few decades three meals a day has become much more flexible with snacks becoming a big part of modern eating. Snacking is contagious. At home, at work, or on the go, snacking is part of culture and daily life. Thinking back to the old rules of snacking, these in-between nibbles were planned and expected, likely in the mid-morning or late afternoon. Those were the days of mealtime rules. The rules, however, no longer apply. This strict way of looking at eating is going out of fashion. No longer are there hard and fast parameters around mealtime. The modern eater has her own rules. Those rules may include multiple smaller portions or some combination of snacks and meals. Many popular diets emphasise frequent eating in smaller sizes. This fits in well with popular snack boxes that have a variety of good for you goodies. The old rules are out the window as well, simply because of lifestyles. During the week, eating is predominantly done at work because that's where most people spend the most time. And workplaces all over the country are helping out by subscribing to healthy snack delivery. While many may still feel three meals a day is necessary, the truth is your lifestyle dictates what, where, and when you eat. If these are considered fluid, eating patterns may be as well. In a study by the Hartman Group, some interesting data informs what snacking looks like today. Snacking occasions represent 50 per cent of all food and beverage events. Now, mealtime doesn’t dictate someone’s schedule; rather it’s the opposite. It’s considered to be a very informal approach to eating, but one that makes more sense for most. From their research, the Hartman Group developed the Modern Snacking Model. Only about 8 per cent of consumers snack little to none. On the other hand, 90 per cent snack multiple times a day and 7 per cent of those have no scheduled meals in favor of just snacking. Snack occasions were once limited to the old rules. Now, the mentality is more "eat when you can". Lifestyles have changed, which means eating does as well. For the most part, dinner is still the one meal that remains traditional, mostly because of its social implications. Breakfast and lunch are much more casual and less likely to be a meal. Now the entire day could have multiple snack occasions instead of meal occasions. This is especially true during the work week where schedules are even more hectic. That's why it's important for workplaces to offer healthy alternatives. Healthy snack boxes make snacking at work an occasion, too. Because snack occasions are changing, many decide to forego standard meals. Research supports this trend, revealing that 31 per cent of Australians say they sometimes snack in lieu of meals, with the majority generation being Millennials. Snacks are no longer just to quell hunger pains—they are a large source of nutrients. This need for nourishment has redefined what a snack is and fuels the demand for healthier alternatives. So, what distinguishes a snack from a meal? First, snacks are smaller portions than meals. Second, snacks are usually between meals. Finally, snacks are less work. There is typically no prep or cleanup necessary with a snack. However, the distinction between meal and snack can be fuzzy. That blurring is changing the whole definition of a snack. In a snacking trend report, 39 per cent of consumers said their definition of snacking has changed and now includes more foods and drinks. Snacking has never been more exciting. And, there are so many brands to try. Healthy snack boxes are a good way to try out new brands to see what you like. Along with a lifestyle change, there are other trends that influence modern snacking. For many, snacking is purposeful. Attributes from the health and wellness sector that have shaped modern snacking including protein-centric foods, superfoods, low sugar, less processing, and alternative carbs. Not only do consumers want healthy snacks, they also want convenience. Snacks need to be portable. New brands are emerging to fill the need for healthy, on-the-go snacks like protein bars or yoghurt. Even well-established brands are introducing new things to keep on trend. Naked Juice (a PepsiCo company) recently introduced chilled snack bars. They contain fruit, nuts, and vegetables. They were created in response to the trend of healthier, high protein snacking. These food trends are popping up in snack boxes as well. The trend to eat smarter isn't just happening at home. It's a big part of workplace dynamics as well. Many businesses have noticed this trend and are now using snack food delivery services. And, the options are varied with choices like gluten-free snack boxes, vegan snack boxes, and paleo snack boxes, which reflect the way that many adults snack. Snacking is a good thing when it’s healthy, meaning it has the attributes discussed earlier. Snacking is now purposeful as a way to fuel the body. When your body takes in proteins and minerals, you are also more likely to not overeat at meals because you'll feel fuller. Snacking is an opportunity for the body to get the nutrients it needs, as long as the snack isn't filled with sugar. Many snackers look to lean proteins found in foods like nuts. Others may be looking to take in healthy fats by snacking on avocados. Whatever it is your body needs, there is a healthy snack to fill it. And there are so many different ways to snack. The average healthy snack box has a variety to please every eater. Yes, it’s true, many social media feeds are filled with food pictures. Individuals like to record their life on social media, including what they eat. They go out of their way to take pictures of their snacks and share them with friends and followers. With this desire to share, consumers also are taking snacking up a level with decadent, customisable foods. Snacking on something unique is not only Instagram worthy but also seen as an indulgence. This highly stylized snacks can still be healthy, combining beautiful colors of fruits and vegetables. The presentation is artistic while the snack remains good for you. In the earlier definition of snacking, one of the signifiers of a snack is that it has to have little prep or clean-up. It needs to be ready to go and available. Snack time is now just about any time. Consumers want something that’s easy and readily portable. That's another reason healthy snack box delivery has become so popular. Convenience has long been a need for snackers. Yet, most ready-to-go snacks, such as candy bars and crisps, fall under the high sweet or high salt categories. If something is available and accessible to the eater, she’ll take what she can find. Consider the snacking options in the workplace. Employees need something quick and easy. They don’t want to have to leave the office, so they wander over to the vending machine. However, they’ll be hard-pressed to find some with healthy attributes. Snacking is very core to workplace dynamics, and people will eat what’s available. They just need to have access to food that is convenient and healthy. There is a sweet spot on the snack continuum for items that taste good, are healthy, and ready to eat. Instead of a vending machine, many businesses are turning to healthy snack delivery. These customisable snack boxes meet a variety of dietary limitations, like gluten-free snack boxes, paleo snack boxes, and vegan snack boxes. Companies can help employees snack better by offering them the convenience of snacks on demand. Snack delivery helps business do just that. Based on research and trend reports, there are some additional ideas of importance relating to how snacking is changing to better suit the modern lifestyle. These changes are driven almost entirely by the way that the majority of consumers snack and eat. Demand is driving supply, influencing many food manufacturers to change their perspective. Here are some important other thoughts on modern snacking. Snacking rules are no more. Snacking isn’t a meal, but that line is very thin. Because of this shift, many more foods are considered snacks. This presents an opportunity for the industry to meet the demand. Healthy snack boxes are meeting this demand in the market. Snacks aren’t necessarily smaller meals, they are a hybrid, and they focus on healthy and fresh instead of processed. Think of the old way people would snack. Someone would go to the vending machine at work and have very few choices. Snack standards have been elevated. That’s why many businesses have turned to healthy snack boxes. It’s a chance to find brands that focus on nutritional snacks that provide clean energy to workers. A healthy snack box subscription also lets your employees know you care about their health. Without the schedule of three meals a day, eating is much more informal. Consumers eat whenever it best suits their life. They decide how to adapt their eating based on what their day will bring. They not only adjust to their own internal clock, but they listen to their bodies and nourish them as needed. But they don’t have to live in some boxed-in type of structure to still eat balanced, healthy portions. When the desire to snack does arise, it's great to have healthy snack boxes so that snackers don't go to the easy bag of chips. At the crux of consumer expectation for snacking is “What will this snack do for me?” These high expectations mean snacks have to do more than fill a consumer up, although the physical aspect of snacking is still important. What you put in your body needs to have a purpose. Snacking may also have emotional and social influences. Socially, snacking is about sharing and conversation. Snacking with others creates a positive experience and fulfills the communal part of eating. This snacking occasion can happen at home when dad shares his apple with his little ones. It occurs at restaurants where diners only order snack-size portions or starters. In the workplace, the break room is often a hub of activity, most of which centers around snacking. When you share food with people, it’s a sign of trust, which could make relationships stronger. This is all made possible with healthy snack box delivery. This concept helps businesses all over the country feed their staff well. As mentioned, snacking at work is a big deal. One of the biggest areas in which healthy snacking is trending is in the workplace. After all, many spend a huge chunk of time in the workplace and could be the main place where all a day’s meals or snacks are eaten. Even though the full-time work week is 38 hours, many work longer hours. With the time spent at work, it makes this an even more important part of modern snacking. This modern snacking is made possible with healthy snack food subscriptions. Healthy snack boxes help workers eat smarter. It takes a commitment to having healthy items accessible. It has to be easy and convenient for workers to make good eating choices. 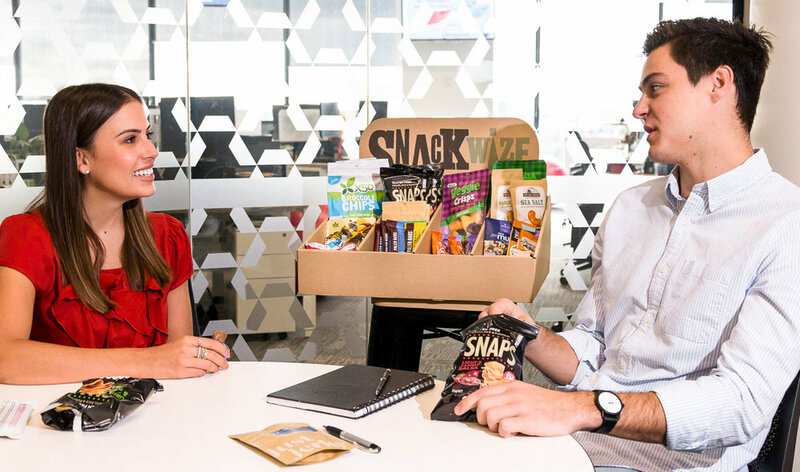 Workplaces all over Australia are switching from vending machines to healthy snack delivery. These monthly snack boxes arrive at your office and are filled with brands that offer healthy, quick snacks. Subscription snack boxes make it simple for businesses to invest in their employees’ health. With most employee wellness plans, nutrition plays a key role. Show workers your commitment to their well-being by supplying them with snacks that fuel them with energy and contribute to their overall health. It’s easy to get started with snack delivery. We offer snack box delivery in Sydney as well as healthy snack subscriptions in Brisbane. What can you expect from Snackwize snack delivery? You can expect brands that are true to being healthy and tasty. Remember, snack boxes can be customised. You can order a paleo snack box one month then a vegan snack box the next. It’s convenient—it comes directly to your office on your schedule. Subscription snack boxes are much better than standard vending machines. So, make the right choice for your employees. They'll love healthy snack food boxes and thank you for it. Try it now with no commitment. Start with your free Snackwize sample box.